Cumulative Total of Over $320,000 Raised for Cystic Fibrosis! Over $61,000 raised at the 8th Annual Hoops for Hope! Held on September 15th, 2018. Thank you to all of the players, volunteers, corporate sponsors, and donors! 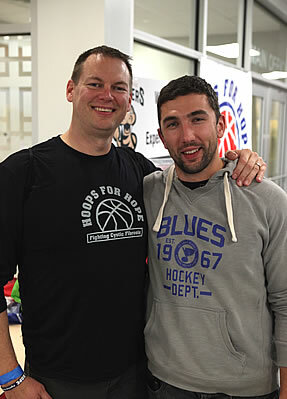 Since 2010 Hoops for Hope has raised a cumulative total of over $320,000 raised in the fight against cystic fibrosis. All Hoops for Hope proceeds are directed to the North Saskatchewan Chapter of Cystic Fibrosis Canada. Play took place on 8 courts with players ranging from recreational to elite in 10 divisions including U14-U18 boys and girls, wheelchair, adult women’s, adult co-ed, and adult men’s.Spectators enjoyed all the action, kids played on the bouncies, and all enjoyed the delicious BBQ thanks to the Saskatoon and District Kinettes. Check out the 2018 event photos! Stay tuned for the date and location of Hoops for Hope 2019! Due to the generosity of our sponsors, Hoops For Hope continues to grow and contribute to cutting edge research so that one day CF will stand for cure found. TWO TICKETS ANYWHERE AIR CANADA FLIES IN NORTH AMERICA! Prizes Include: U of S Premium Flex Pass Packages, Galaxy Tab E, Ski packages, Hotel Stays, Restaurant packages, and much more! Click here for prize details and fundraising tips! Raise $100 and receive a Hoops For Hope swag bag filled with free stuff, and more! To raise awareness and funds in support of cystic fibrosis research and care while at the same time developing a unique community-building event in Saskatoon. Dollars raised support Cystic Fibrosis Canada which funds cutting-edge research that directly impacts the lives of people with CF as well as ensuring excellence in care close to home. Education and advocacy promote managing with the disease on a daily basis as well as access to life-changing medications. Please feel free to contact us with any questions, feedback, or donations.